AMMAN — Striving to highlight Jordan's role in the fight to reduce global warming and address its impact on the Kingdom, the Royal Society for the Conservation of Nature (RSCN) has created the world's largest candle mosaic, setting a new Guinness World Records title. Some 700 people participated in the record-breaking event, where a 112.4sq.m. mosaic of candles depicting the Earth Hour logo (60+) was created at the Amman Citadel on Saturday evening. An official Guinness World Records adjudicator attended the event and confirmed that Jordan had successfully made its way to the records book. The RSCN organised the record-breaking event to coincide with the global celebration of Earth Hour, marked annually on March 23 to raise awareness on global warming. 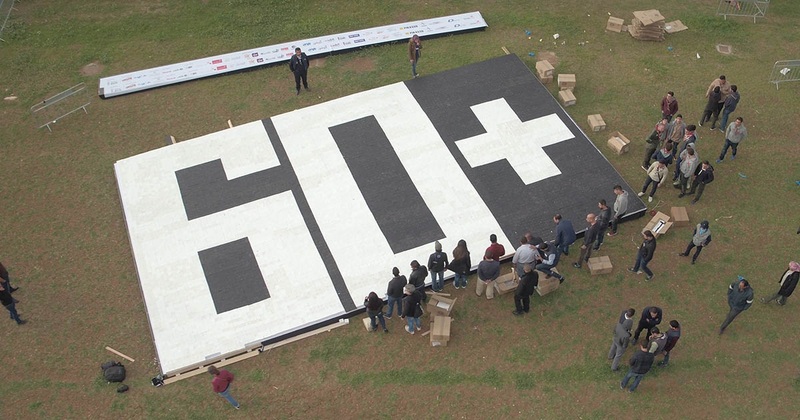 The mosaic of the Earth Hour logo (60+)was made of more than 11,000 black and white candles, produced by the women of local communities at the Mujib Biosphere Reserve and Wadi Faynan. "For Jordan to set a new world record aims at drawing attention to global warming and raising more public awareness, while also highlighting the Kingdom's efforts on different levels to fight global warming," RSCN Director General Yehya Khaled told The Jordan Times. He underlined that the RSCN has been marking Earth Hour in Jordan for the past 11 years, underlining that so much has been achieved in the quest for cleaner and more sustainable environment in Jordan over the past decade. "We can see that climate change is becoming more mainstreamed in policies and investment plans as well as in water and energy sectors," Khaled said. He said that the country has achieved major milestones in climate change-related efforts, explaining that Jordan now hosts significant investments in wind and solar energy, while a dedicated fund on renewable energy has been set up to encourage renewable energy projects and policies. The Kingdom has been marking Earth Hour by switching off streetlights on several of the capital’s main roads, in addition to lights at government agencies, archaeological sites, nature reserves and scores of hotels, restaurants and homes. The annual event seeks to raise people’s awareness on environment challenges and how the excessive use of energy exploits our natural resources. On this year’s Earth Hour, the Sydney Opera House, the Eiffel Tower and Moscow’s Red Square were among the world landmarks that went dark, as part of a global campaign to raise awareness about the impacts of climate change, according to the Agence France-Press (AFP). Across 187 countries, millions of supporters observed Earth Hour by turning off their lights at 8:30 pm local time in what organisers describe as the world’s “largest grassroots movement for climate change,” AFP reported.